Season Two Premieres Sept 21 9/8c – Join the discussion Now! Home » Season Two Premieres Sept 21 9/8c – Join the discussion Now! 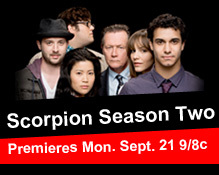 Scorpion Season 2 Premieres Monday, September 21, 9/8c on CBS. Head over the the forum to join the discussion. What are you looking forward to the most this season?